Rhoda Grant MSP, Cathal Doherty of Road bridge. Danny Finch of Moray Offshore, Julian Brown of MHI Vested and Bob Buskie of the Cromarty Forth Port Authority. That was the message yesterday from Dan Finch, a director of the £2.6 billion Moray East wind farm, who said experience gained offshore was vital to his sector as it tackles the challenges of developing deep sites in increasingly deep water locations. 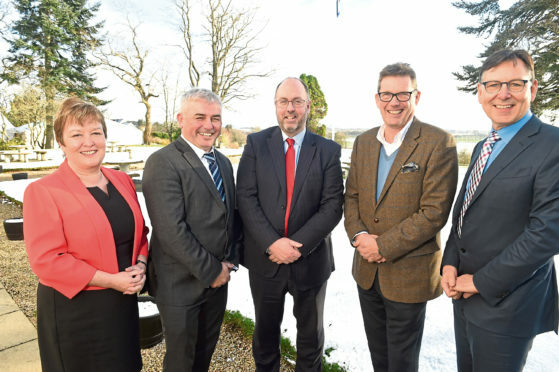 His comments came at an event to mark the Port of Cromarty Firth’s (PCF) selection as an intermediate port for the construction of the 100-turbine Moray East development under a £10m contract. The UK Government is considering a number of areas around Britain for the establishment of an offshore renewables hub. Mr Finch said: “The PCF is a trust port, a well-established focus for local economic activity with extensive local relationships. Work on a £30m expansion of the PCF’s infrastructure is now under way. The project, being carried out by civil engineering firm Roadbridge UK, is due to be completed by next March – ahead of the port’s 18-month role in the Moray East development.